Amid the general euphoria and high-octane wackiness with which the performances of Loose Tubes lit up the London jazz scene in the second half of the 1980s, Julian Arguelles’s saxophone solos were always a highlight: calm, beautifully shaped, emotionally resonant. He was still in his teens, diminutive and boyish-looking, when he first appeared with that extraordinary collective, but his playing already possessed a maturity that suggested a long and rewarding career to come. After Loose Tubes disbanded in 1990 (they’re reforming in May for dates at the Cheltenham Jazz Festival and Ronnie Scott’s) he formed an octet which made two albums that stand among the most stimulating documents of their time: Skull View (Babel, 1997) and Escapade (Provocateur, 1999) are full of memorable composing, resourceful arranging and fine improvising from the likes of Mike Walker (guitar), Mario Laginha (piano) and Django Bates (tenor horn). Arguelles managed to make the ensemble reflect his own qualities. This is music that manages to be supremely lyrical while staying cliche-free, and in which exquisite textures are coaxed from a seemingly limited palette. If you can find the discs, they’ll repay the investment. Now he has a new album out: Circularity, on the Rome-based CamJazz label, in which he is joined by the pianist John Taylor, the bassist Dave Holland and the drummer Martin France. Back in 1990 Taylor and France featured on Arguelles’s recording debut as a leader, a quartet album on the Ah Um label called Phaedrus (on which Mick Hutton was the bassist), and the drummer was also present on the octet albums. Arguelles is 48 now, no longer a precociously gifted youngster but a musician of poise and substance, equally eloquent on his soprano and tenor instruments, fully at home in this A-team company, capable of providing a set of compositions that play to his own strengths while providing a challenge for his companions, each of whom performs to the height of his known abilities. I don’t suppose Taylor has ever played an ungraceful note in his life, while Holland — a US resident since answering Miles Davis’s siren call in 1968 — gives every sign of enjoying the chance to play with compatriots. France keeps the whole thing cooking with a wonderfully light touch and an unflagging rhythmic imagination. And if, like me, you have a weakness for jazz inflected by what Jelly Roll Morton famously called “the Spanish tinge”, meaning such things as John Coltrane’s “Ole”, Gil Evans’s “Las Vegas Tango”, Albert Mangelsdorff’s “Never Let It End” and Charlie Haden’s “Song for Che”, you’ll enjoy the Arguelles quartet’s “Unopened Letter”, which starts in the time-honoured manner with double-stopped bass strums and soprano trills and works its way through an exemplary seven minutes of intense but never forbidding collective invention. * The photograph above is from the sleeve of Circularity, and was taken by the recording engineer, Curtis Schwartz. 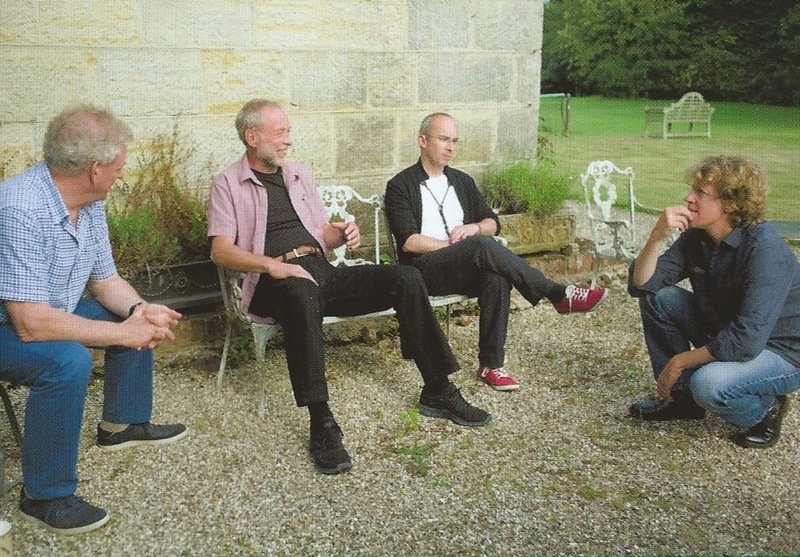 Left to right: John Taylor, Dave Holland, Julian Arguelles and Martin France.